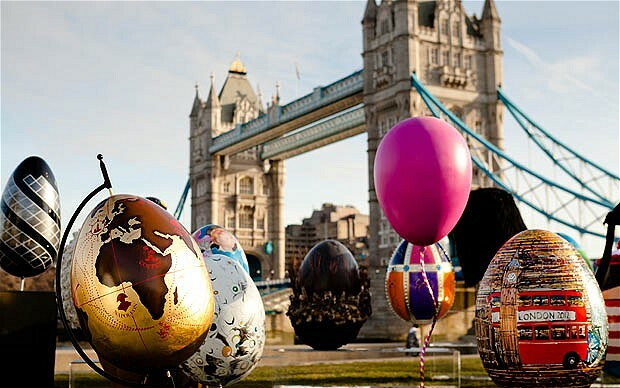 Easter is almost here and what better way to enjoy it than with a one of a kind Egg Hunt in THE city of the Olympics this year - London! 210 eggs (created by names such as Mulberry, Diane Von Furstenberg, Selfriges a.o.) have been put o display for The Grand Eggstravaganza! in Covent Garden where they can be admired 2rd to 9th of April. Hurry up and have a look at what you will be searching for aftwerwards in London's city for 40 days and nights. 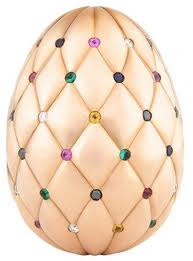 There is of course a nice surprise behind this "treasure hunt" - there are keywords to be found on each egg, and for each correct one submitted,there will be one more chance for you in a draw which could have you at the end as the winner of the Faberge Diamond Jubilee Golden Egg (estimated around 100.000 pound sterling - see picture below). Enjoy the hunt and don't forget to be a kid again! Oh, and one more thing - if you decide to, and it is still available, you can own an egg of the 210, just by winning an auction for it, so start bidding now!